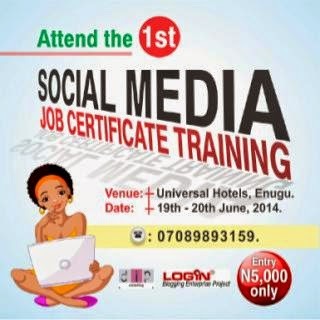 of this project geared towards bridging the knowledge gap between social media existence and maximal deployment. Since its establishment in June, 21 2013, the LOGiN Enterprise project has groomed bloggers of note like Chukwudi Iwuchukwu’s blog, Onuoha precious blog and many other brands who are LOGiN Enterprise Project alumni and with partnership form the LOGiN Bloggers Network. Since the inception of this initiative on June, 21st 2013, this brand has hosted 3 intending bloggers workshops, 1 bloggers master class, hosted the 1st Abuja Bloggers party and also an online Business of Blogging training. - and corporate social media officers/ managers grooming. The Job fair is a 1 day free interactive and knowledge-trade session that precedes a 2-day practical social media certificate training workshop holding from the 18-20th of June. This will put Enugu internet savvy population on the world map. With seasoned facilitators and social media endorsers like Cynthia Anaele, a Blogger, Physicist and project coordinator, Jenny Chisom, an entrepreneurial blogger, Pst Edwin Biayeibo, Pastor and Radio host of “Lean on me”, Marche Nini, Enugu top blogger and tweeps @coal_city who gives a scoop of Enugu to the rest of the world, the coal city sure got a facelift with youth participation in enterprise and viral marketing. It is historic as we applaud the commitment of the Enugu state government for an enabling environment for a knowledge-based internet powered project.